A member of the House of Representatives representing Ijesa South Federal Constituency, Hon. Israel Ajibola Famurewa has congratulated Mrs. Kafayat Oyetola, the wife of the Osun state governor, Gboyega Oyetola. In his congratulatory message made available to newsmen in Osogbo on Tuesday hailed the Governor's wife saying she is a strong supporter and lover of the governor. He described Mrs. Oyetola as as an amiable woman and mother who has impacted lives of the indigent and people of the state. Famurewa asked God to bless Mrs Oyetola with long life and more prosperity. "May God prolong your life and grant you good health of mind and body. Congratulations to you to our loving first Lady," Famurewa prayed. 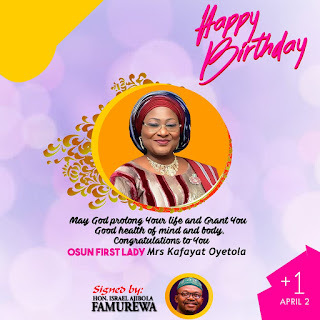 The lawmaker also congratulated Governor Oyetola on his wife's birthday saying that "our amiable governor is very lucky to have the first lady as his wife. She is a great woman."